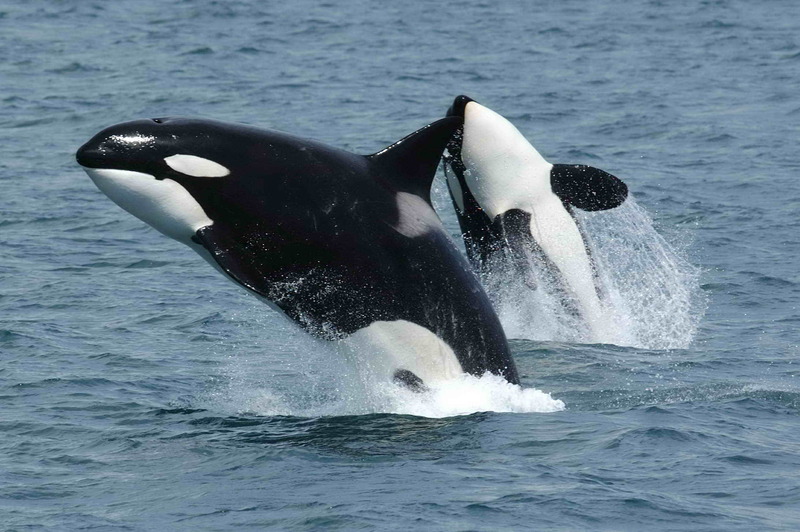 These are killer whales in the wild. Notice how nice and firm and erect their dorsal fins are. Now look at the photo of a killer whale in captivity; sorry, I don't have one handy that's in the public domain. But trust me, a killer whale in captivity has a limp dorsal fin. Why do to you think that is? Probably it happens because they're cooped up in a relatively tiny tank and forced to interact with humans in a way that is completely contrary to their natural tendencies. Maybe it's purely physical, or maybe it's a sign of depression. Maybe it's both. Either way, these are some of the Earth's largest, most violent, most intelligent creatures. Nobody should be surprised when they get pissed off about being held in captivity and forced to perform stupid tricks for their sustenance. My heart goes out to the dead woman trainer's family. I have to assume she knew and accepted the risks of playing patty cake with a 6 ton killer whale.